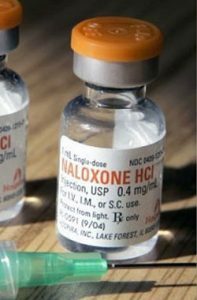 “The FDA announced new efforts to expand naloxone access Thursday by making it easier for companies to make over-the-counter (OTC) versions of the opioid overdose treatment. “The vast majority of young people struggling with addiction to opioids are not receiving medications that have been recommended to treat their disease, a new study shows. Only one in four received one of the medications approved by the U.S. Food and Drug Administration – methadone, buprenorphine or naltrexone – within three months of their diagnosis, according to the report in JAMA Pediatrics. Has the Medicaid Expansion Issue Finally Been Settled? If so, What’s the Best Way to Make Expansion Work? Much has been written about the impact of Medicaid expansion on the opioid crisis and access to medication-assisted treatment (MAT). A group associated with amfAR, the Foundation for AIDS Research, has helped put the issue to rest. Under lead author Alana Sharp, the group gathered data from all states, from 2011 to 2016—covering the years before and after expansion—to assess the effects of expansion. Did Medicaid Expansion Worsen the Opioid Crisis? More opioid prescriptions were written for Medicaid enrollees after expansion than before. The number written increased almost equally in expansion states and in nonexpansion states. Expansion states saw a marked increase—more than 200%, the authors estimated—in prescriptions written for buprenorphine and naltrexone. In nonexpansion states, the increase in prescriptions written was far less— estimated at less than 50%. Methadone prescribing dropped in all states, but the drop was greatest in expansion states. 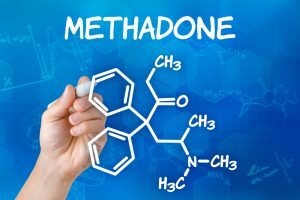 Unlike buprenorphine and naltrexone, methadone is prescribed for pain as well as for opioid use disorder (OUD). This meant that investigators couldn’t separate the data to figure out what effect Medicaid expansion had on the number of methadone prescriptions written specifically for OUD. Medicaid expansion can be a useful tool—but Medicaid itself must be “substantially strengthened” first. That’s the opinion of Keith Humphreys, PhD, the Esther Ting Memorial Professor of Psychiatry and Behavioral Sciences at Stanford University, expressed in an editorial in the same issue. Dr. Humphreys, who is a member of the Stanford Neurosciences Institute, works with policy makers to reduce the negative impact of substance use on public health and safety. Regarding the amfAR team’s findings, Dr. Humphreys called them “a welcome indication that Medicaid can in fact contribute to resolving the most destructive epidemic that the United States has faced in decades.” The American Journal of Public Health published the amfAR article and Dr. Humphreys’ editorial in its May issue. 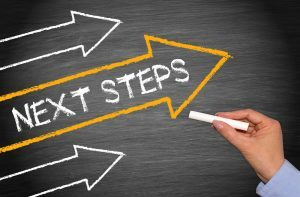 States can use Section 1115 Medicaid waivers to shape some Medicaid provisions to their advantage. Medicaid expansion has been critically important for low-income adults in New York and three other states, according to an October 4, 2017 report from the Center on Budget and Policy Priorities. New York received $7.7 billion for adults in Medicaid expansion in federal fiscal year 2015, a Medicaid in New York fact sheet said. How can states get the most out of Medicaid expansion? Dr. Humphreys listed several requirements if Medicaid expansion is to reach its maximum effectiveness. The map below shows 10 remaining holdouts—9 states and Washington, DC—as of May 24. All Medicaid programs should cover the four levels of care specified by the American Society of Addiction Medicine (ASAM) (see citation in References). The levels of care are standard outpatient, intensive outpatient, residential inpatient, and medical inpatient. Usually patients with OUD need more than just medication. At this writing, estimates indicate that only about a dozen state Medicaid programs cover all four. Medicaid programs should cover—at higher rates—more services related to substance use. States that do currently reimburse may be setting their rates too low, Dr. Humphreys said. 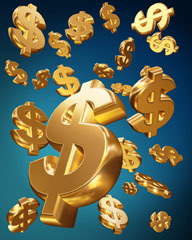 Because current average rates are lower than those of other insurances, it’s difficult for patients to find providers. Dr. Humphreys believes that broader coverage would likely drop crime levels and cut transmission of hepatitis C virus (HCV) and HIV—probably resulting in fewer overdoses, and a healthier population of patients with OUD. All insurance plans—not just Medicaid—need to find ways to reduce opioid overprescribing, misuse, and related problems. Dr. Humphreys noted in his article the value of Medicaid in the response to the opioid epidemic—but he added that decisions “to not sufficiently expand its number of enrollees and the scope of its services” have limited Medicaid’s potential. AT Forum asked Dr. Humphreys what types of additional Medicaid expansion would be most useful. He referred us to a paper he coauthored on this topic, published in Health Affairs (see References). The article noted that the failure of many states to cover all levels of care restricts treatment providers who are trying to make the best decisions for patients. For example, patients assessed as “needs close monitoring” are at high risk in states that fail to cover residential treatment, or level 3 residential, or level 2 intensive outpatient services. A third key concern: lack of coverage of all four medications for opioid use disorders—something that’s necessary for effective treatment. They point in particular to methadone—“the medication covered by the fewest states”—despite the fact that methadone remains the “most efficacious and rigorously studied medication” for opioid use disorders. Now that it’s clear that Medicaid expansion isn’t at fault for the opioid crisis, where does the real problem lie? Perhaps the Senate will take another look at the problem, with a fresh eye. Sharp A, Jones A, Sherwood J, Kutsa O, Honermann B, Millett G. Impact of Medicaid expansion on access to opioid analgesic medications and medication-assisted treatment. AJPH. 2018;108(5):642-648. Epub April 4, 2018. Humphreys K. How Medicaid can strengthen the national response to the opioid epidemic [editorial]. AJPH. 2018;108(5):589-590. Epub April 4, 2018. Broaddus M, Bailey P, Aron-Dine A. Medicaid Expansion Dramatically Increased Coverage for People with Opioid-Use Disorders, Latest Data Show. Washington, DC: Center on Budget and Policy Priorities; February 28, 2018. https://www.cbpp.org/sites/default/files/atoms/files/2-28-18health.pdf. Medicaid in New York. June 2017. Fact Sheet. The Henry J. Kaiser Family Foundation. http://files.kff.org/attachment/fact-sheet-medicaid-state-NY. One Year in, Pennsylvania Medicaid expansion prompts celebration and new outreach. Elana Gordon, April 29, 2016. From a reporting partnership that includes WHYY, NPR, and Kaiser Health News. https://whyy.org/articles/one-year-in-pennsylvania-medicaid-expansion-prompts-celebration-and-new-outreach/. 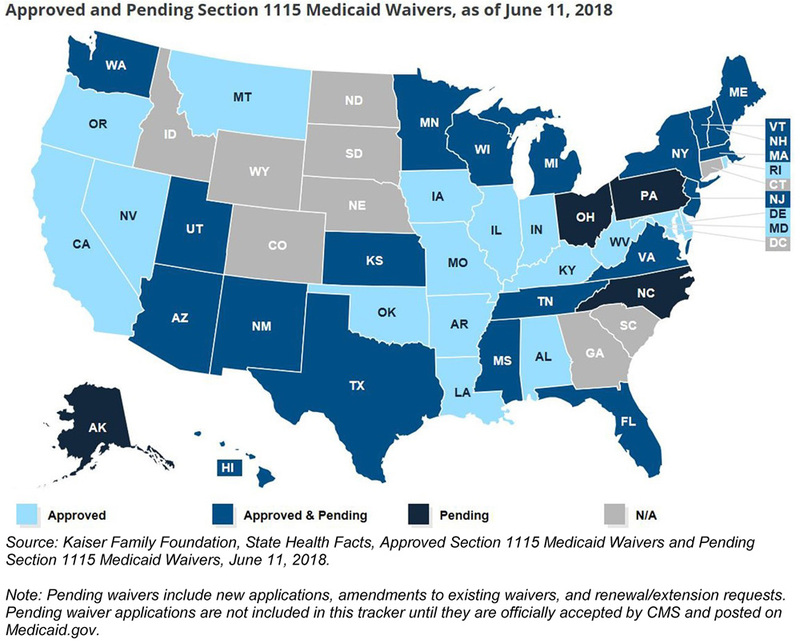 Medicaid Waiver Tracker: Which States Have Approved and Pending Section 1115 Medicaid Waivers? May 24, 2018. The Henry J. Kaiser Family Foundation. 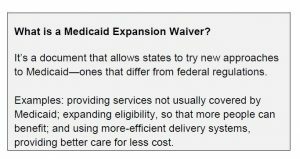 https://www.kff.org/medicaid/issue-brief/which-states-have-approved-and-pending-section-1115-medicaid-waivers/. What are the ASAM Levels of Care? Continuum: The ASAM Criteria Decision Engine. Knowledge Base. May 13, 2015. https://www.asamcontinuum.org/knowledgebase/what-are-the-asam-levels-of-care. Katch H. Medicaid Expansion is Critical for States Fighting Opioid Epidemic. Washington, DC: Center on Budget and Policy Priorities; October 4, 2017. https://www.cbpp.org/blog/medicaid-expansion-is-critical-for-states-fighting-opioid-epidemic. Grogan CM, Andrews C, Abraham A, et al. 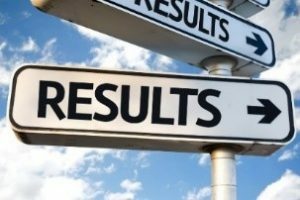 Survey highlights differences in Medicaid coverage for substance use treatment and opioid use disorder medications. Health Affairs. 35:2016;12:2289-2296. MACPAC. Penny Thompson, MPA, Chair. Chapter 4: Access to Substance Use Disorder Treatment in Medicaid. In: Medicaid and CHIP Payment and Access Commission. Report to Congress on Medicaid and CHIP. South Washington, DC. June 2018;80-112. https://www.macpac.gov/wp-content/uploads/2018/06/Access-to-Substance-Use-Disorder-Treatment-in-Medicaid.pdf. Accessed June 21, 2018. 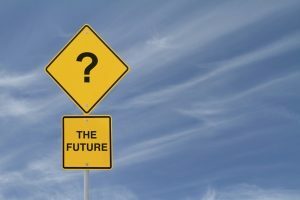 “Patients prescribed medication-assisted treatments with buprenorphine, methadone, and naltrexone are getting older…as we all are. This is wonderful, because it means our patients are surviving, making it to old age. Methadone has been prescribed for the longest of the three, so we tend to see more older patients on it. 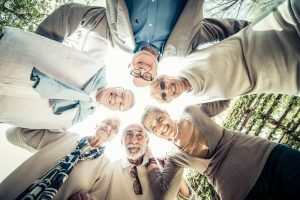 Aging in our patients can present specific challenges; research literature shows high rates of physical and psychological illness in opioid users in general, meaning as this population ages, we can expect to see even more co-occurring illnesses. “San Francisco will begin supplying anti-addiction medication to long-term drug users and homeless people on city streets, an attempt to overcome a formidable obstacle to treatment that has complicated efforts to address the opioid crisis. “This month, the House and Senate will be marking up dozens of opioid-related bills, some of which attempt to expand access to the triad of Food and Drug Administration–approved medications to treat opioid addiction: methadone, buprenorphine, and injectable naltrexone. As physicians who have helped thousands of people sustain their recovery with these proven medications, we welcome enhanced funding and access to them. 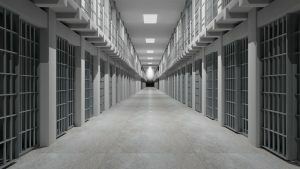 At the same time, we lament the reality that many of the people with opioid addiction who are among those at highest risk of death are unlikely to receive them: those in jails and prisons.